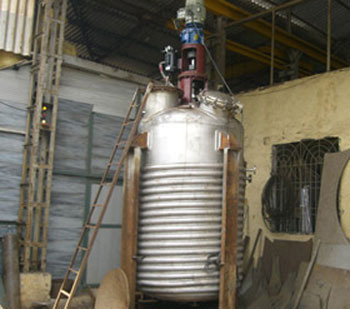 Backed by a team of dexterous professionals, we are engaged in manufacturing, exporting and supplying a wide range of Chemical Reactor. We professionals manufacture this system by making use of optimum quality components and contemporary technology in conformity with international standards. Our offered is widely used in chemical and pharmaceutical industries. In order to deliver defect free range at client's end, our offered range is stringently tested by our quality controllers against various parameters. Established in the year 2007, we “Satyam Engineers,” are engaged in manufacturing, exporting and supplying the finest quality range of High Speed Mixer, Dump Hopper, Auto Clave and Reactor, Rotary Dryer, Storage Tank, Ribbon Blender, Heat Exchanger, Reaction Vessel, etc. These products are designed and manufactured from high grade factor inputs that are sourced from reliable and certified vendors of the industry. Offered products are manufactured in compliance with defined industry standards. These products are available in different specifications as per the needs of clients. Our product range is highly appreciated by our clients for its attributes like high performance, precision engineering, compact design, corrosion resistance, durability and longer life.